My dad and I were doing the final sign check in Timberlea when a stranger drove by on her bike yelling "Tomorrow's the big day!" "Yee haaa," I yelled back. "I'm voting for you," she said, stopping her road bike to chat with us for a few minutes. What was reassuring is that she knew all about me, my dedication to the community, my performances on the Keyano Theatre stage and my platform located on my website. I had never met this wonderful lady before, yet she was completely convinced that I need to be on the new Council. I'm sure that every candidate has had these kinds of encounters and I'm cautious about getting too confident on the eve of this very important day. But, I'm feeling good about our chances, and the chances of my colleagues who I would be proud to serve with on the new Council. It was great to get a call from Dave Kirschner this evening, wishing me the best and sharing a mutual passion for our region. 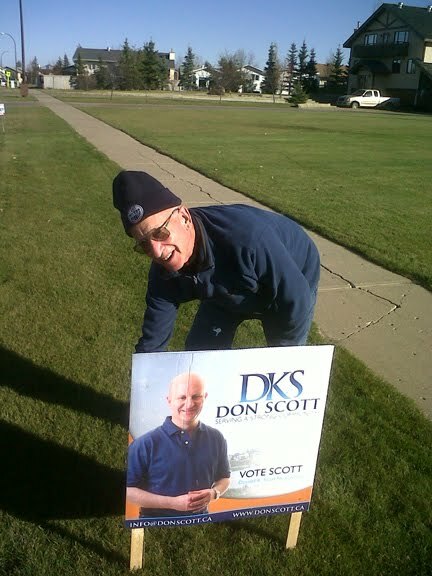 It's also been a pleasure getting to know Don Scott through this campaign. "A kindred spirit," he calls me. I feel the same way, and not just because we look like brothers. I'm convinced we share a similar vision for Wood Buffalo and a style of leadership that honours, respects, listens and learns. Doing the math, there are 15 hopefuls for 6 spots in Ward One. I think there are a group of 8 of us that could end up with enough votes to be successful. But, one never knows. If there is one thing that history has taught us about elections, it's to expect the unexpected. I'm grateful for all the folks behind the scenes at My Community My Voice who envisioned a new way of engaging the voters and made it real. I'm grateful for our friends in the media who have told our stories and shared their perspectives. I'm grateful for Zafar Iqbal and the work of Express Media for stimulating discussion and debate with our growing population of new Canadians. I'm grateful to all the candidates and their support teams for their efforts and their friendship. It has been an honour working with you to hopefully inspire more participation in this election than we've seen in years. Finally, I want to thank my family and my team for standing behind me in these many weeks since I announced my candidacy for Council. Without your encouragement, sacrifice and understanding this would not have been possible.